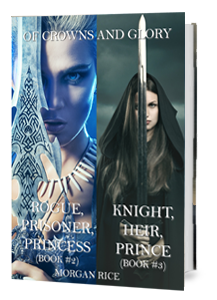 A bundle of books two and three in Morgan Rice’s new #1 Bestselling epic fantasy series OF CROWNS AND GLORY (ROGUE, PRISONER, PRINCESS and KNIGHT, HEIR, PRINCE). Here are two bestselling novels, all in one convenient file. Over 150,000 words of reading, all for an incredible price—it also makes the perfect gift!